ELA.RL.7.2: Determine a theme or central idea of a text and analyze its development over the course of the text; provide an objective summary of the text. ELA.RL.7.1: Cite several pieces of textual evidence to support analysis of what the text says explicitly as well as inferences drawn from the text. ELA.RL.7.3: Analyze how particular elements of a story or drama interact (e.g., how setting shapes the characters or plot). ELA.RL.7.4: Determine the meaning of words and phrases as they are used in a text, including figurative and connotative meanings; analyze the impact of rhymes and other repetitions of sounds (e.g., alliteration) on a specific verse or stanza of a poem or section of a story or drama. ELA.RL.7.6: Analyze how an author develops and contrasts the points of view of different characters or narrators in a text. ELA.RL.7.5: Analyze how a drama's or poem's form or structure (e.g., soliloquy, sonnet) contributes to its meaning. ELA.RL.7.10: By the end of the year, read and comprehend literature, including stories, dramas, and poems, in the grades 6-8 text complexity band proficiently, with scaffolding as needed at the high end of the range. ELA.RI.7.1: Cite several pieces of textual evidence to support analysis of what the text says explicitly as well as inferences drawn from the text. ELA.RI.7.3: Analyze the interactions between individuals, events, and ideas in a text (e.g., how ideas influence individuals or events, or how individuals influence ideas or events). ELA.RI.7.2: Determine two or more central ideas in a text and analyze their development over the course of the text; provide an objective summary of the text. ELA.RI.7.4: Determine the meaning of words and phrases as they are used in a text, including figurative, connotative, and technical meanings; analyze the impact of a specific word choice on meaning and tone. ELA.RI.7.5: Analyze the structure an author uses to organize a text, including how the major sections contribute to the whole and to the development of the ideas. ELA.RI.7.6: Determine an author's point of view or purpose in a text and analyze how the author distinguishes his or her position from that of others. ELA.RI.7.9: Analyze how two or more authors writing about the same topic shape their presentations of key information by emphasizing different evidence or advancing different interpretations of facts. ELA.RI.7.10: By the end of the year, read and comprehend literary nonfiction in the grades 6-8 text complexity band proficiently, with scaffolding as needed at the high end of the range. ELA.RI.8.2: Determine a central idea of a text and analyze its development over the course of the text, including its relationship to supporting ideas; provide an objective summary of the text. ELA.RI.8.3: Analyze how a text makes connections among and distinctions between individuals, ideas, or events (e.g., through comparisons, analogies, or categories). ELA.RI.8.1: Cite the textual evidence that most strongly supports an analysis of what the text says explicitly as well as inferences drawn from the text. ELA.RI.8.4: Determine the meaning of words and phrases as they are used in a text, including figurative, connotative, and technical meanings; analyze the impact of specific word choices on meaning and tone, including analogies or allusions to other texts. ELA.RI.8.5: Analyze in detail the structure of a specific paragraph in a text, including the role of particular sentences in developing and refining a key concept. ELA.RI.8.6: Determine an author's point of view or purpose in a text and analyze how the author acknowledges and responds to conflicting evidence or viewpoints. 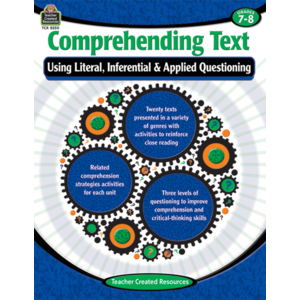 ELA.RI.8.10: By the end of the year, read and comprehend literary nonfiction at the high end of the grades 6-8 text complexity band independently and proficiently.